A review of volunteered geographic information for disaster management (Geography Compass). Haworth, B., and Bruce, E. (2015), A Review of Volunteered Geographic Information for Disaster Management. Geography Compass, 9, 237–250. The immediacy of locational information requirements and importance of data currency for natural disaster events highlights the value of volunteered geographic information (VGI) in all stages of disaster management, including prevention, preparation, response, and recovery. The practice of private citizens generating online geospatial data presents new opportunities for the creation and dissemination of disaster-related geographic data from a dense network of intelligent observers. VGI technologies enable rapid sharing of diverse geographic information for disaster management at a fraction of the resource costs associated with traditional data collection and dissemination, but they also present new challenges. These include a lack of data quality assurance and issues surrounding data management, liability, security, and the digital divide. There is a growing need for researchers to explore and understand the implications of these data and data practices for disaster management. In this article, we review the current state of knowledge in this emerging field and present recommendations for future research. Significantly, we note further research is warranted in the pre event phases of disaster management, where VGI may present an opportunity to connect and engage individuals in disaster preparation and strengthen community resilience to potential disaster events. Our investigation of VGI for disaster management provides broader insight into key challenges and impacts of VGI on geospatial data practices and the wider field of geographical science. Recent disaster events remind us of the importance of geospatial data and the need for timely and reliable communication in all aspects of disaster management, including prevention, preparation, response and recovery (PPRR). Volunteered geographic information (VGI) provides new opportunities for citizens to create and share geographic information for disaster management. VGI refers to practices of people from the general public creating and sharing their own geographic information, enabled by particular technological advancements, including the growth of Web 2.0, GPS, broadband communication, cloud storage, and mobile devices such as smartphones (see Goodchild 2007). VGI contributions in disaster management may involve something as simple as somebody posting a relevant photo on social media or it may involve more complex activities, such as the hundreds of volunteers from across the world who worked together using OpenStreetMap to contribute online spatial information for what became the most comprehensive mapping available following the 2010 Haiti earthquake (see Meier 2012). The emergence of VGI has important implications for both individuals and authorities in disaster management, representing numerous opportunities but also significant challenges. In this article we categorize these as being broadly related to data collection and dissemination, data quality and security, data management, and empowerment. With VGI, the speed and volume of data creation and dissemination has increased dramatically. Information can now be communicated from authorities to communities for disaster management at a fraction of the cost of traditional means of communication. Members of the public can also now create, share, map and communicate information with authorities and with each other in more diverse ways, even if they are not located at the disaster location. As anybody with technology access is now able to contribute, creating disaster related geographic information is no longer just for experts. 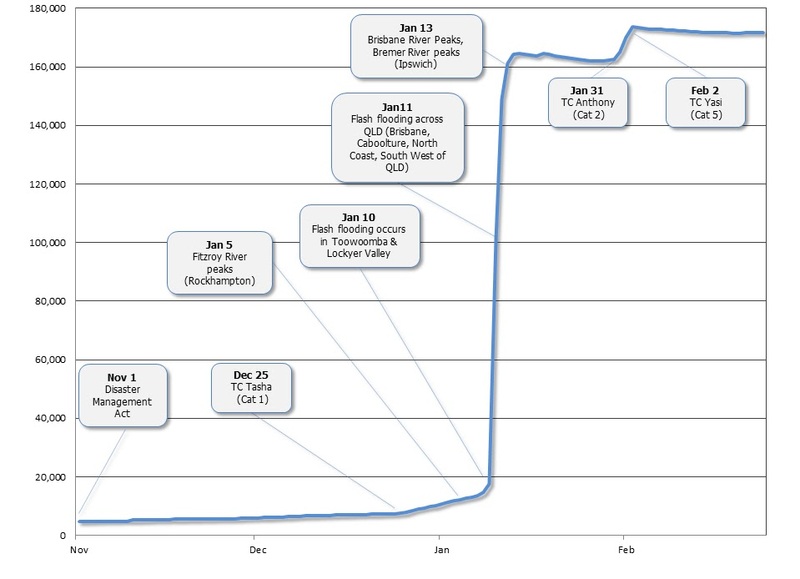 The Queensland floods of 2010/2011 saw social media play a critical role, with high numbers of people flooding sites like Facebook and Twitter to share disaster-related information (see Bird, Ling & Haynes 2012). Here, social media facilitated fast and broad information mobility. Posts were re-shared widely, demonstrating the power of social media to promote and propagate messages. This was particularly true for messages of support, but the same mechanisms can also work to spread misinformation or false content. Data from private citizens with varying agendas and experience often have quality issues. Studies have reported on important issues of quality control, misinformation, spurious or fraudulent postings, duplicate and doctored images, and the lack of ‘right’ information for disaster relief (see McDougall 2011, Ostermann & Spinsanti 2011). Further, it is often difficult to discern the credibility of online sources. Individual’s physical and online security may be compromised by utilising low-quality VGI. The nature of VGI is that it is often made openly available to the general public. Data of this nature may be particularly compromising during a disaster event, especially when those affected are at their most vulnerable and privacy may be less of a priority than in ‘normal’ circumstances (see Crawford & Finn 2014). For example, a geotagged image of a disaster-impacted property provides useful information to emergency authorities if shared through social media, but that same information about the location of a vulnerable and potentially vacant property may also be available to those with malicious intent. Individuals, authorities and humanitarians should be particularly cautious when using VGI provided through social media (Goolsby 2013), and it should not be assumed that everybody is well informed to manage their own privacy settings online (Crawford & Finn 2014). Various lines of evidence have been proposed for why the quality of VGI can approach the standards of authoritative data (see Goodchild & Glennon 2010). For example, sites like Wikipedia are proof that crowdsourcing is an effective way to remove errors with large numbers of people reading and verifying information. But how many people are needed for this to be true? And how quickly can information be verified in this way during fast paced emergencies? By its nature user generated content is broadly incomplete, and despite very large volumes of data, bias is not removed. A second example is that advances in positional technology, such as improved GPS in mobile devices, and the increase in familiarity of the public with things like social media, the internet, maps and smartphones means data quality is increased. But this provides no guarantee users consistently operate devices correctly or that they are aware when the technology is not functioning properly. Advances in technology do not necessarily eliminate human error. As researchers continue to seek new applications for these data, innovative methods are needed for empirical validation of the quality and credibility of VGI. Data from the general public presents a number of challenges for data management which are particularly relevant to disaster management. The sheer volume of information provided through VGI is a current obstacle to its efficient use in emergency management, highlighting the need for effective methods to mine, filter, verify, and summarise these data and data sources to ensure credible and relevant content. Various researchers are exploring ways to address this, such as methods to automatically identify relevant key words in Twitter data (Ostermann & Spinsanti 2011). Traditionally, spatial data infrastructures‘ (SDIs) top-down model of supporting digital data access, storage, and sharing is unlike the bottom-up approach on which VGI is established. VGI challenges the assumption that formal organizations are the producers of geospatial information and users are the passive recipients (see Budhathoki, Bruce & Nedovic-Budic 2008). For disaster management, opportunity exists for VGI to augment existing SDIs, providing valuable localised and contextual information for planning decisions and encouraging information flow between communities and authorities. Due to the higher level of inherent risk to life and property in disaster management decision-making, liability concerns may deter organizations from integrating VGI into their datasets (Shanley, Burns, Bastian & Robson 2013). As websites have a global reach and laws vary widely, liability risks in and across foreign jurisdictions need consideration. VGI site operators, users, and contributors must all have some awareness of the legal and ethical issues that may be triggered by their activities, including issues of intellectual property, liability for faulty information, and defamation (Scassa 2013). Empowerment is described as an individual’s capacity to have control over their personal affairs and confront hazard issues while receiving the necessary emergency management support (Bird, Ling & Haynes 2012). 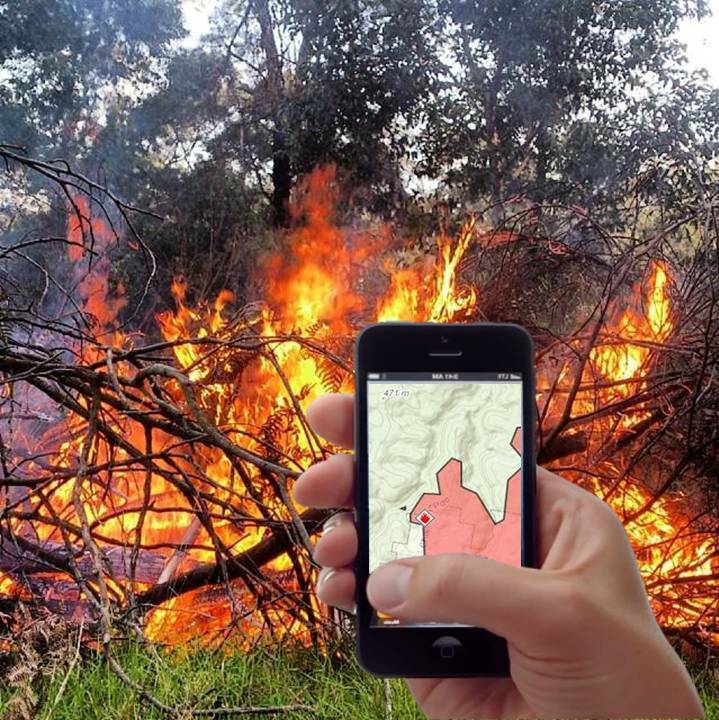 It has been argued that VGI empowers individuals to georegister their observations, transmit them through the internet and translate them into readily understood maps and reports (Goodchild & Glennon 2010). But does this indicate VGI can enable individuals to achieve connectedness, more control, and empowerment in disaster management? While VGI may empower some citizens to contribute and engage in disaster management, it also acts to marginalize others. If we consider the digital divide, what is the role of citizens with limiting socio-economic circumstances or those in parts of the world without access to these ‘empowering’ technologies? VGI cannot represent ‘the everybody’ and in fact favours ‘the privileged’, or those with money, access, and time to utilize the technology (see Haklay 2013). For those that are ‘included’, the use of geospatial data from the crowd has been shown to enhance existing inequalities (see Crawford & Finn 2014). Local information contributed during the 2010 Haiti earthquake crisis was translated into English and subsequently mapped and reported in English, preventing the Kreyòl speakers who messaged for help from benefiting from their own data, thus reproducing unequal power relations between the poor Haitians and the rich who acted on the information (as reported in Crawford & Finn 2014). VGI in the preparation and prevention phases of disaster management. This review shows that contemporary research on the role of VGI in disaster management predominantly focuses on the response phase of the PPRR cycle. Directing increased attention to the pre-disaster phases may present an opportunity for VGI to foster community engagement and empower individuals to be more directly involved in risk reduction practices. There is a need for further research on the technical and critical dimensions of VGI and for human geographers to engage with GIScientists to comprehend the implications of these data and data practices for citizens, traditional methods of disaster management, and geography as a discipline more broadly.